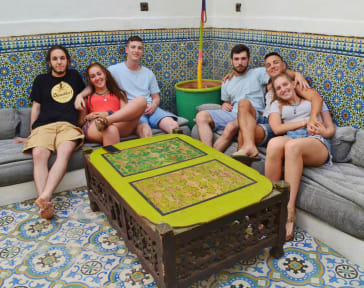 Kaktus Hostel is a traditional Riad (house with a patio garden in the centre) located less than a minute’s walk (about 100m) from the mythical place that is Jemaa El Fna Square, making it an ideal location for your stay in Marrakech. Most of the monuments and other tourist hotspots are within walking distance from the hostel. The property is comprised of five dormitories, a patio and a sublime terrace with stunning views of Koutoubia mosque looking across to Jemaa El Fna Square, here on the terrace you can enjoy the never ending magic of Marrakech. Kaktus Property also offers homemade Morrocan cuisine for lunch or dinner served daily, with delicious traditional dishes that Morocco is famous for. Our tour desk provides excursions to the Atlas Mountains, Sahara Desert and the beautiful coastline of the Atlantic, with departures for day trips and longer tours guaranteed everyday. Discounts can be offered depending on the size of the group. There are numerous activities to keep you busy, including walking tours, cooking classes and so much more. 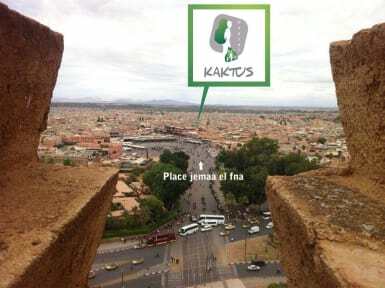 Kaktus property has been created by two developers of luxury accommodation in Marrakech who were looking for a challenge. We wanted to create an economical and socially responsible property. Kaktus Property is more than just a simple accommodation for travelers; it is a place of experimentation into sustainable development, as well as a place for artists and culture to thrive. We are very conscious of our impact on the environment and our global footprint. In order to do this we adopt a number of principles in order to minimize our waste, electrical energy and water consumption. We start with the training and awareness of our staff. We educate them on issues of ecology and attitudes to adopt in regards to reducing our economic footprint. All of our furnishings have been manufactured by recycled materials using a DIY concept converting old useless materials into fantastic new designs. All our organic waste and part of our non-organic waste is recycled, reprocessed or reused. We are involved in many projects in the region for the rehabilitation of natural sites and reforestation and reducing desertification. Finally we are open to other projects with similar interests; if anyone has any ideas as to what we can do we’d love to hear them! The hostel staff is amazing! We were very well receveid by Yahya and Yassine, which are big fans of soccer (by the way, they play really well!). Furthermore, the atmosphere of the hostel is wonderful, they have a great localization next to the main square and they also organize tours to the desert. Breakfast is good and served in a nice rooftop. Location is amazing, pretty close to main square. They also provide the desert excursion, which is awesome. Chill place. Good vibes. Good rooftop. Amazing staff! Tivemos uma ótima experiência no Hostel Kaktus, um hostel bem limpo, confortável e com café da manhã. Ele fica bem no centro da Medina de Marrakesh, pertinho da praça central e dos souks, mas apesar disso ele é tranquilo e silencioso. Fizemos também uma excursão ao deserto que reservamos diretamente com o hostel e foi muito bom! Na volta ainda nos deixaram descansar no hostel e tomar um banho antes de seguirmos viagem. Bem localizado, limpo, barato e o atendimento do Karim é genial!! Recomendo a todos!! Great staff, localization and price. I had a good experience there and have no complaints. Good for the price. Close to the main square ( Jaama El Fna). Yahya and Yassine are always avaliable to help you. The breakfast it’s not that good. The location and the price are the most interesting thing to choose the hostel. Bom hostel em Marrakesh. Equipe muito receptiva. Bom café simples mas típico em qualquer acomodação do gênero na cidade. e Excelente localização (apenas 200m da praça El Fna. Após o check-out, eles nos permitiram utilizar as instalações para banho e repouso nas áreas comum, o que nos ajudou e é muito importante para muitos viajantes. Super Recomendo! Good hostel in Marrakesh. Friendly staff. Good breakfast but simple, tipical breakfast in Marraco’s hostels.